Ideal for effective management of genu recurvatum (knee hyperextension) during gait. A strategically placed adjustable pneumatic air bladder placed behind the hyperextension control strap significantly improves comfort and enhances gait while controlling genu recurvatum. There are no hinges in the brace design. 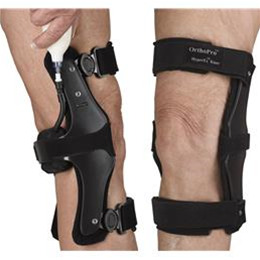 The 10-inch-long brace allows for sitting and walking while wearing the brace. There are two anterior straps to hold the brace in place. Extremely lightweight and comfortable, the HyperExÔ Knee is a welcomed alternative to Swedish Cage Knee designs. Orthotic therapy to effectively control genu recuvatum, hyperextension of the knee joint. A strategically placed adjustable pneumatic air bladder placed behind the knee joint is filled with enough air to prevent backwards movement of the knee joint during gait. The “rebound” off of the air bladder facilitates an improved gait by encouraging knee flexion following full extension. While seated with the leg fully extended, the OrthoProÔ HyperExÔ Knee is applied to the patient’s leg. While still seated, air is inserted into the air bladder tube on the lateral upper end of the brace. Enough air should be inserted so that the knee becomes slightly flexed (5 to 10 degrees). As the patient walks, the genu recurvatum moment is stopped at neutral and the knee will rebound off the air bladder to initiate flexion of the knee joint. Gait should be significantly improved. Adjust the amount of air in the air bladder to patient comfort and the amount hyperextension control required to optimize gait. Small OP 403-0 L/R 12" - 15"
Medium OP 403-1 L/R 15" - 19"
Large OP 403-2 L/R 19" - 21"
Xlarge OP 403-3 L/R 21" - 25"